The Senate Judiciary Committee on Thursday approved more than three dozen nominees to the federal bench, paving the way for a full vote before the Senate as President Trump continues to reshape the federal judiciary. The nominees include six to the federal circuit courts, to which Trump has already appointed 30 judges. The Senate Judiciary Committee also approved 34 nominees to the federal district courts, two to the U.S. Court of Federal Claims, and two to the U.S. Court of International Trade. Five of the six nominees to the federal circuit courts were approved along party-lines. The 44 judicial nominees passed out of the committee marks the most approved in a single markup since 1981. The picks will now head to the full Senate where, if confirmed, they will join the 85 judges Trump has named to the federal bench, including two to the U.S. Supreme Court. The Senate is largely expected to confirm the nominees, as Republicans hold 53 seats. The president’s success with installing federal judges has been a key achievement of his administration. Trump took office with more than 100 judicial vacancies, and the Senate moved quickly to confirm his nominees, making a conservative imprint on the federal bench. In the first two years of his administration, Trump has appointed a historic number of judges to the federal circuit courts, outpacing the last five of his predecessors at the same point in their presidencies. 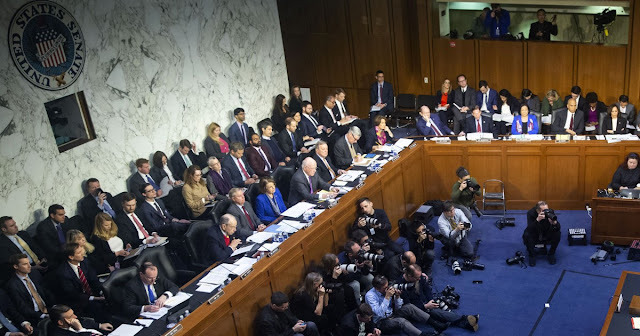 The judicial nominees approved by the Senate Judiciary Committee on Thursday were nominated to their respective judgeships last year, but the Senate did not act on those nominations before the new Congress was sworn in. As a result, the White House renominated a slate of 51 judicial nominees last month. Among those approved by the committee are two, Bridget Bade and Eric Miller, to the 9th U.S. Circuit Court of Appeals, considered the country’s most liberal circuit court. There are currently six vacancies on the San Francisco-based court, and if Trump fills all of the empty seats, it will bring the 9th Circuit closer to parity, with 13 judges appointed by Republicans and 16 appointed by Democrats. The slate also included one nominee to the 3rd U.S. Circuit Court of Appeals, Paul Matey, on which there are currently two vacancies. If Trump successfully fills both empty seats, which includes Matey, the Philadelphia-based court would flip. Several of the nominees came under fire from Democrats during their respective confirmation hearings for their past comments, writings, and resumes. On Thursday, critics called some “problematic” for their “extreme” views. Wendy Vitter, wife of former Sen. David Vitter, R-La., and Trump’s pick for the federal district court in Louisiana, faced scrutiny during her confirmation hearing for refusing to say whether Brown v. Board of Education — the nation's landmark desegregation case — was rightly decided. Allison Jones Rushing, Trump’s nominee to the 4th U.S. Circuit Court of Appeals, was questioned by Sen. John Kennedy, R-La., about her “life experiences.” She’s also been criticized for her youth — at 36, she would be the youngest appeals court judge if confirmed — and work with Alliance Defending Freedom, a conservative judicial group.